Since my husband and I have started eating real food, I wondered how I would deal with the holidays. With Valentine’s coming around the corner I wanted to make something we could enjoy, without “cheating”. 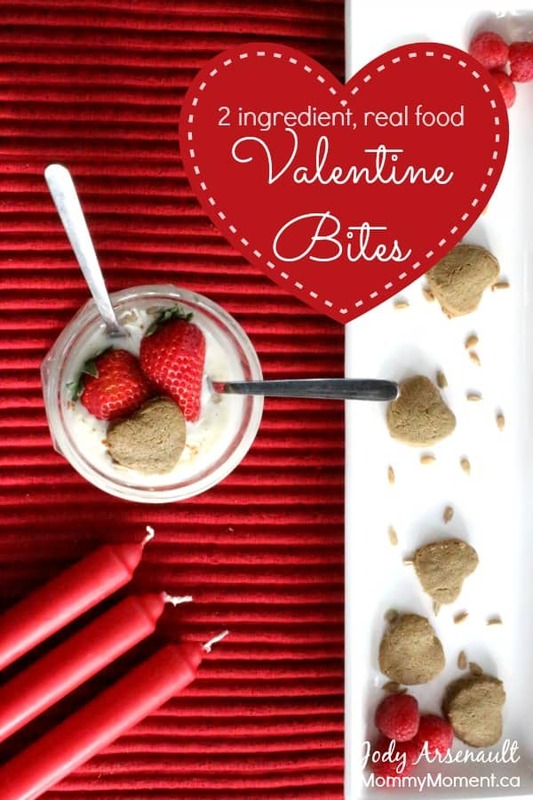 I decided that a parfait-for-2 could be a romantic type real food dessert – and these little 2 ingredient Valentine Bites make the perfect topper. Please note, these are not sweet at all, if you want them to be sweet (similar to a peanut butter cookie), you can add 1/4 cup of sugar to the ingredients. You can also substitute peanut butter for the sunflower seed butter if you like. Beat the egg and add the sunflower seed butter. Stir till it is a soft dough type consistency. 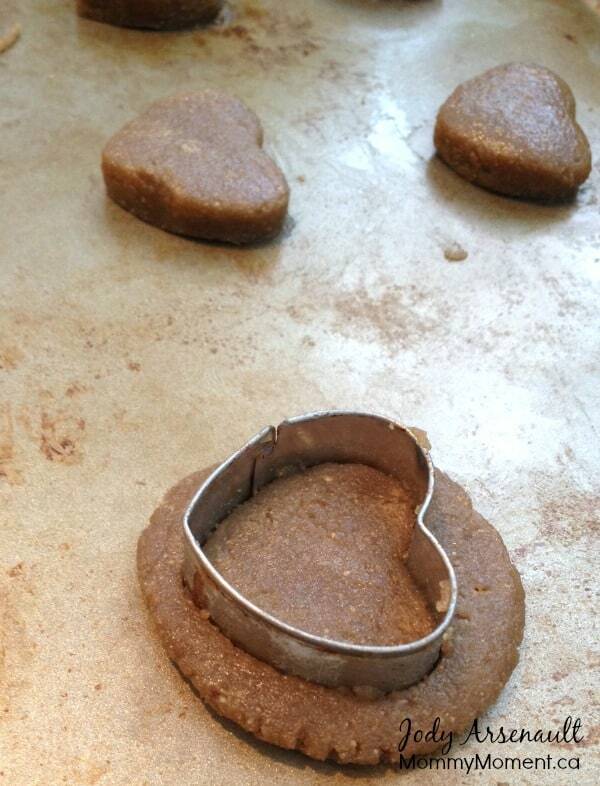 Roll in little balls and press down with a fork on the cookie sheet (or use a small heart cookie cutter the size of a quarter). Once the oven is preheated, put the cookie sheet in the oven and bake for 20 minutes. Remove the pan from the oven and let sit for 10 minutes before removing the little bites. These bites are easy to crumble. Before eating the parfait, crumble the Valentine Bite along with some coconut on the top and you’re set. 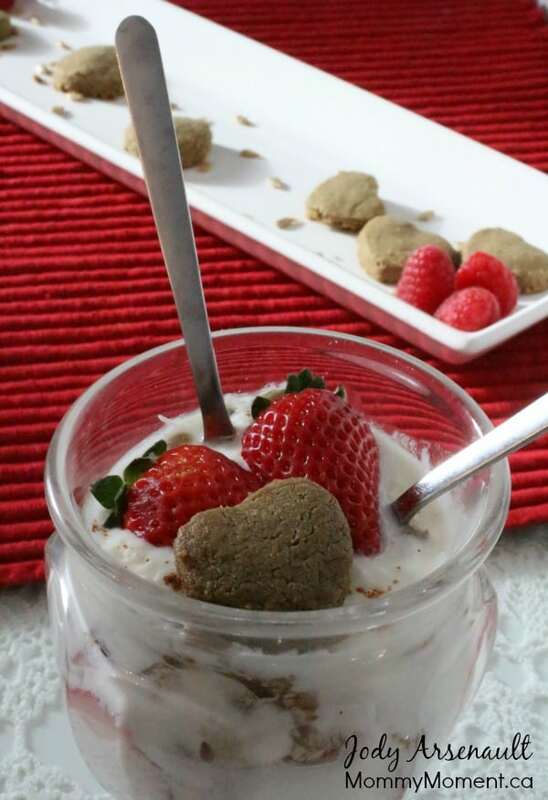 On the top of the parfait, I crumbled a Valentine bite, cinnamon & extra coconut. If you want it sweeter, you can add your choice of maple syrup, honey, agave – or you could use a store-bought sweetener yogurt if that is what you are used to. You can sign-up to get an email update each day, follow us on Twitter, Facebook, Pinterest, Instagram, Google+, Blog Lovin’ and NEW Sulia! Easy and nutritious! I bet these taste delicious. Hey that rhymed lol. 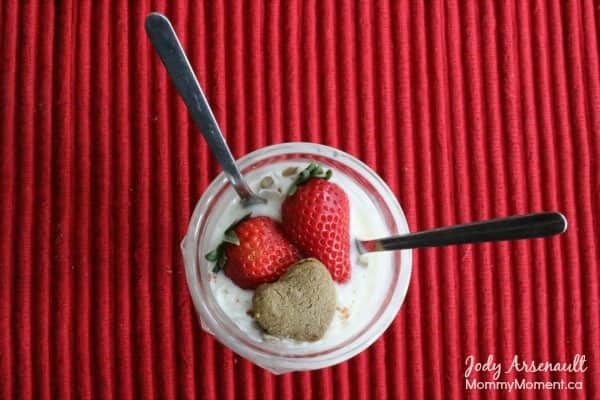 They are so easy to make and my girls love crumbling them on their breakfast parfaits – a fun and healthy little treat. Thanks for your comment Stacie! That is so cute, and easy too. I’m going to have to try this! Thanks Tammi. It is about as easy as a recipe can get and the girls find it so fun to crush the hearts into a crumble for their parfaits – who said food couldn’t be fun?! Yum! I’m going to buy sunflower butter now! Though I’m wondering how they would work with almond butter….. If you have almond butter just use that. I have that in the recipe as an option. I used sunflower butter so it would be nut free. Ah! How did I miss that! Lol! Thanks! You are every welcome! Peanut butter would work too – change it up to what you have available. New one on me. Sunflower Butter. I’ve heard of the Almond Butter but not Sunflower Butter. I’m going to check it out. These would be great with a little honey drizzled on top. Thank you for the recipe. Quick and easy. Even peanut butter would work – I used sunflower seed butter so that it would be nut free if my kids wanted to sprinkle them on their yogurt at school. These look so yummy! A must try! I absolutely LOVE the simplicity of this recipe Jody. All too often, people think healthy and picture it being pricey and extensive. However, you have proved it doesn’t have to be!!!! Thank you! I was wondering how we were going to survive a healthy valentine’s day too – can’t wait to try these!!!! Love the bites, for the parfait what kind of coconut are you using? I am using unsweetened, shredded coconut in this parfait. These look really cute and the bites sound lovely! Thanks for sharing! I don’t think it gets much simpler! What a neat & quick idea, thank you so much for sharing this with us all! Thanks Darlene! It is really easy and my girls love getting to crumble the hearts – of course I love that it is healthy & fun. Oh me too!! More so that I can make’m in any shape for any occasion .. gem post! thanks again! This looks yummy! Might have to try it! That’s easy. .. what else can it goes with, my hubby doesn’t like yogurt. I suppose you could crumble it on cereal or oatmeal or even ice cream. Wow! Great idea! I’m going to have to try this sometime this weekend! Oh this sounds good, i have to try. Get out! Where did you find this recipe? At times I contribute to an organization and there are quite a few gluten intolerant people and this would be perfect for more of a sit down meal. Not just cookies. I made up this recipe, I knew peanut butter bites only had a few ingredients, so I made this variation. I think it is awesome! I will definitely take it for a test run! At times complimenting a meal can be tricky when trying to serve gluten intolerent. Such a great idea and cute presentation.